Our usually calm and gentle awakening and arising process suffered a set back this morning. While I was, as they say, “at my toilet”, something put the fear of God into a covey of California quail that was foraging beside the house. The quail took to the air with much squawking but one of their number didn’t quite make it over the house. Instead, there was a tremendous crash as it flew straight into the wooden siding. It sounded more like the bough of a tree hitting us to me but Carol had seen something of what happened and explained. Carol’s the brave one – I am squeamish about dead or, even worse, injured animals. She went and investigated and discovered the hapless bird on the ground still breathing. It could have been stunned so we left it a while to see if it recovered. Its breathing soon ceased. The surviving quail seemed to realize that one of their number had gone missing and, having escaped whatever original danger spooked them, returned to investigate. A couple went over to the body of their late companion and then wandered off. Intriguing behaviour. We’ve seen a covey a number of times so I suspect that these quail are resident. It was going to be a slow news day since we were destined to get a little stir-crazy sitting in waiting for the delivery of a case of wine. The wine was originally scheduled to arrive “sometime before 6:00 PM”. Fortunately, Carol managed to contact someone who, in turn, managed to adjust the schedule to between 2:00 and 2:30. So, let’s continue the bird theme. Whilst sitting on the deck soaking up the sunshine, Carol spotted a woodpecker in one of the nearby trees. We’d previously been treated to a visit by a species localized to the west coast of California, Nuttall’s Woodpecker. After a little investigation on the “All About Birds” web site, our new visitor, we think, proved to be the more common and wider-spread Downy Woodpecker. Downy Woodpeckers apparently readily join other birds and this one was certainly amongst some Chestnut-backed Chickadees. There are a few flowers around the house, including a head or two of agapanthus (which should, I’d have thought, be agapanthi in the plural) that still seem to have some nectar and have been visited on one or two occasions by what I think is a female Ana’s Hummingbird. 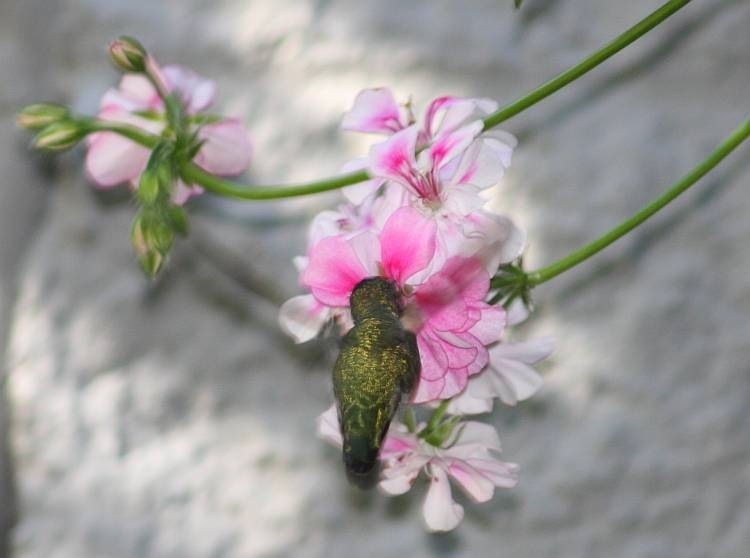 We’ve seen the same type of hummingbird flitting around the flowers at the Corte Madera shopping mall and at Steve and Kathy Delman’s house. Today, it flew through by us on the deck but failed to stop at the remaining flowers. They are both very quick and tiny so darn difficult to snap. I know, I was trying at the Corte Madera mall to the initial consternation of the mall security guards who seem concerned that photographers are industrial spies. 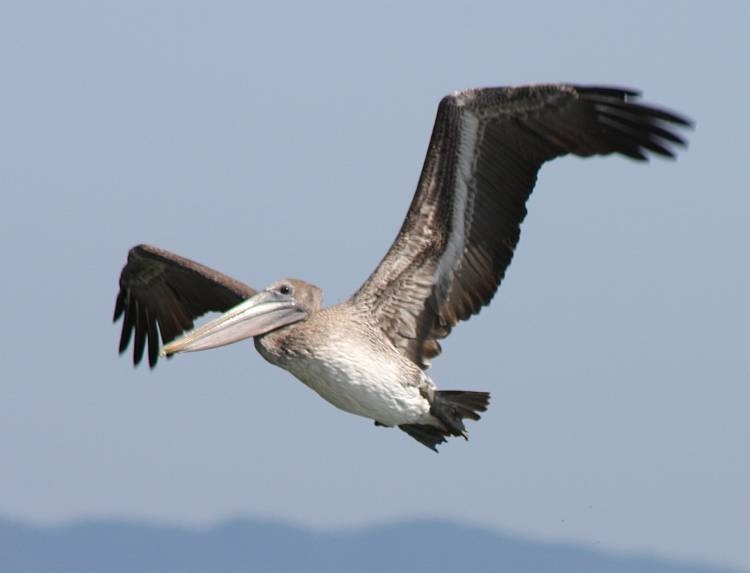 I was considerably more successful grabbing some shots of the much larger and slower Brown Pelican which treated me to a fishing trip to Drake’s Bay, yesterday. It made a couple of visits while we were there and was occasionally lunged at fish in the rollers before they broke into surf on the beach. The lunging was quite fast and, as I have previously noted, these birds are nowhere near as ungainly as they might appear. Now I’m intrigued as to what fish it was finding. Down in Point Reyes Station we spotted a group of Red-winged Blackbirds. These might be one of the most abundant birds in North America but to those of us unfamiliar with this continent’s bird life, they make quite an interesting sight, nonetheless. In addition to the widely spread and abundant Turkey Vultures, which seem to have a disturbing habit of keeping their eyes on both us, lest we suddenly turn into food, and our lunch, lest we drop it, there are herds of Wild Turkeys roaming the countryside. 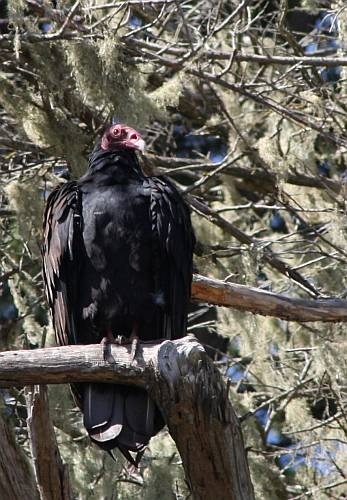 (Turkey Vultures hunt by scent and this shot seems to show well the large nostrils.) Today we saw a group of a dozen or so wandering through a field in Nicasio as we drove to the Delman’s house for a very enjoyable dinner.